The Amish Traditional Pie Safe will warm your kitchen, dining room or pantry with an inviting, rustic style. Pie safes were originally used for storing pies, cakes, and bread and are also called pie cupboards, pie chests or kitchen safes. The Amish Traditional Pie Safe has remained a popular item for storage and display. Available in three sizes, you can customize this stylish pie safe to best suit your needs. Choose your favorite solid wood and finish; we are happy to supply samples for you to consider. Your choice of copper or raised panel doors. Select the shelf and drawer combination that works best for your busy kitchen. In the Kitchen: Store spices, baking supplies, measuring cups, mixing bowls and more. In the Dining Room: Use as a storage/display case for glassware, dishes, and collectibles. In the Guest Bedroom: Store linens, towels, and blankets. In the Playroom: Store toys and games. 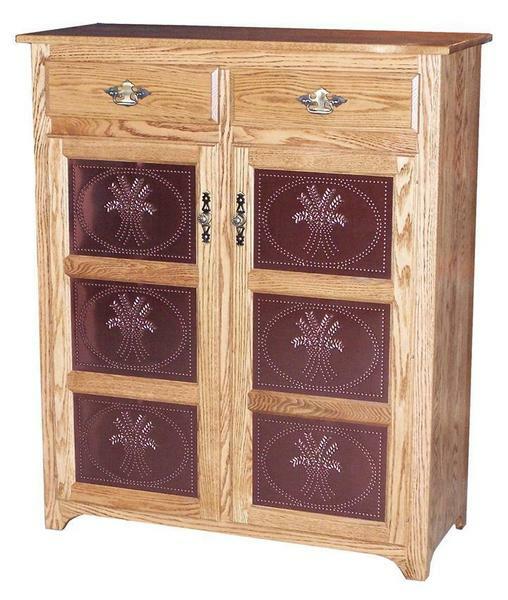 Consider our Amish Traditional 2-Door Pantry with this Amish Traditional Pie Safe. Need a housewarming gift? This heirloom quality pie safe will last for generations to come. Call one of our Amish Furniture Specialists today at 1-866-272-6773 with any questions. Delivered last night and he and his co-driver where very prompt and professional. That you the piece looks great!